Here in New England, we've still got at least a few more weeks of winter, and for many of us this means little or no riding. But just because it's too cold for breeches and boots doesn't mean we can't help our horses stay in good shape! Below is a list of exercises which are easily done in a stall or aisle way, when it is just too cold or icy to go out. On Friday, February 17th, at 6 PM I'll be giving a presentation on the elements of balance in the horse. It will take place at Upper Main Farm, 49 North St, Hatfield, MA.This free event is a fun, low-key way to learn to recognize and promote healthy movement and reduce resistance. If you've already seen the presentation, come again for a refresher! Those of you who have worked with me may find these exercises familiar. If you don't know them yet and would like to learn, drop me a line! Some of the simpler exercises are described below in case you'd like to try them on your own. For others, I've given tips for getting the most out of the exercise. They are divided into two categories: releasing tension, and building strength. Each session with your horse should contain elements of both! Many of these exercises are drawn from TTouch or Connected Groundwork. Special thanks to Paula S. and her horses Grant and Telstar for modeling! Each horse has his own unique bracing patterns, which can become more and more ingrained into their bodies, preventing full range of motion and thus good balance. Recognizing and releasing tension is a crucial part of training a healthy, happy equine partner. Try one of these exercises to release tension, then step back and wait for the lick-and-chew! 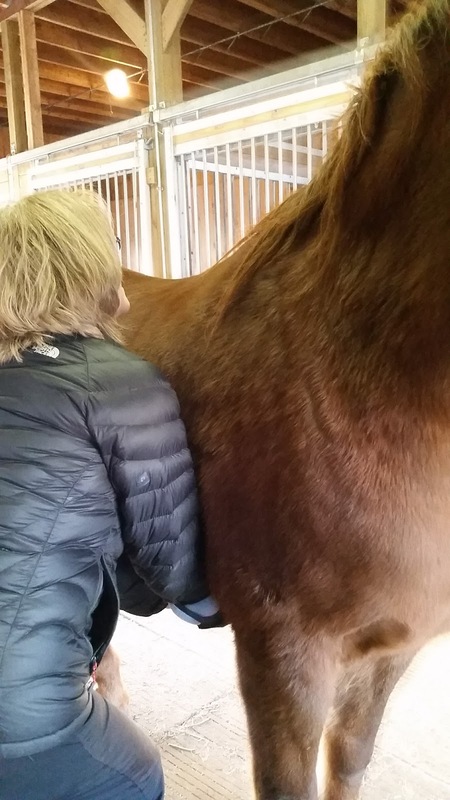 Massage: Even if you aren't trained in the art of massage, you can help your horse's muscles. Start by grounding yourself and releasing your own tension. Then gently run soft hands over each of the horse's major muscle groups, either in long, sweeping strokes or in circles. Use light pressure and tune in to the texture of the tissue. Work your way over the whole body and pay close attention to the horse's responses. Leg circles: Hold the horse's leg as though you were about to pick the foot. Ground yourself and release tension in your back. From your center (not your arms), move the horse's leg in circles parallel to the ground. Start with small, rapid circles and gradually progress to larger, slower circles as the horse releases. Slowly spiral the circle down towards the ground and release the foot when the toe touches down. Cheek press, spine roll, pelvic tilt, and tail work: these Connected Groundwork and TTouch techniques all help release tension in the horse's neck and back, greatly improving both performance and mood! Front leg ligament release: Hold the horse's leg as though you were about to pick the foot. Ground yourself and release tension in your back. Slowly release the hoof while holding the fetlock until the joint is fully extended. Then, support the hoof and lower the fetlock until it is below the hoof, and the joint is once again fully flexed. Once again, lower the hoof until the joint is extended again. Repeat until the hoof touches the ground. If the horse snatches the hoof upwards, repeat the exercise from the beginning. Rib Press / rib release: start at the front with connection to the head, or at the back with connection to the tail. 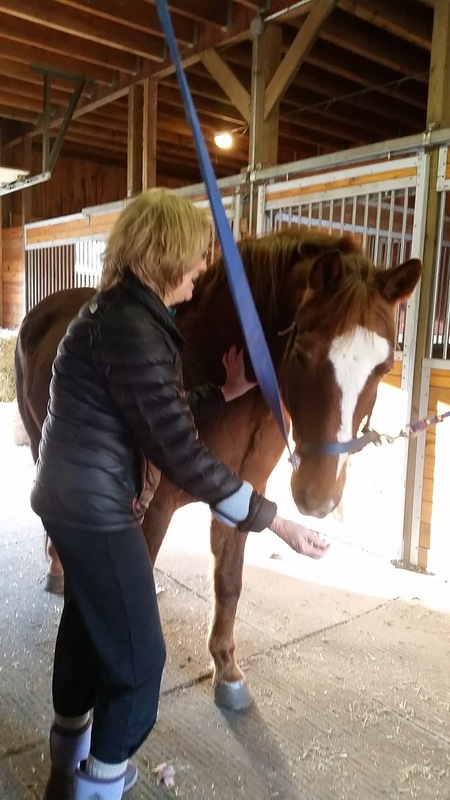 Scapula release: Pick up the horse's front foot and hold the pastern with your outside hand, keeping the foot high. With your inside hand, reach in-between the horse's front legs and take hold of the back of the horse's elbow. Ground yourself and release your back. Move the elbow in an oval, mostly front to back with a little side to side. Start small and gradually increase the size of the oval. Keep the motion smooth. If there is resistance, use smaller ovals. Platform stands: Teach your horse to put his front feet up on a board or platform then lower his head. This is a great way to stretch many important muscle groups! If your horse is very tight, start with a small platform, like a thick board. Be sure it is strong and level. Neck lifts, back lifts, lower back lifts, and pelvic crunches: These exercises involve finding your horse's trigger points. Once you've found them, ask for the horse to engage a little higher and a little longer each time, gradually building strength and endurance. Wall sits: This exercise involves teaching the horse to back up towards the wall, shift their weight back, and release their neck forward. If you've never done it before, be sure to learn this highly valuable technique from an experienced trainer. Transitions: Even the shortest aisle is long enough for a horse to walk a few steps, halt, back up, and walk on again. Be sure your horse is light in the hand, using a wand if necessary to keep the horse from rushing or lagging. Once the horse is halting, backing, and walking on softly, try going directly from backing to walking to backing again! Do you have other exercises which have helped you and your equine companion stay strong and limber while cooped up inside? Drop me a line and tell me about it!